If you want to see a lot of Sri Lanka independently, Kandy is the best base. This former medieval kingdom (founded by King Sena Sammatha Vikramabahu who reigned 1474-1511 after moving his capital there from Gampola) is blessed not only with the sacred Temple of the Tooth (dating from 1592), but also with an easy-going ambience, a lake, a nature reserve and lots to see, and is ideally located for making day trips to other parts of Sri Lanka, whether by train, bus or hired vehicle. Day trips from Kandy can be made to the ancient cities of Anuradhapura and Polonnaruwa and also to the Dambulla Cave Temple and the former rock citadel of Sigiriya. There are several wildlife sanctuaries within easy reach, as well as the Pinnawela Elephant Orphanage, and the two botanical gardens (Peradeniya and Hakgala near Nuwara Eliya) and the forests and tea gardens of the hill country. Kandy is within easy reach by road to the east coast resorts of Trincomalee, Passikudah and Arugam Bay, popular during April to October when the sea is calmer and the climate better. It’s possible to journey to the south coast too and then up through the west coast resorts to Colombo. A popular time to visit is during the annual 10-night perahera (a procession of elephants, dancers, jugglers, acrobats and whip-crackers) in honour of the Sacred Tooth, culminating on the night of the full moon; this year that’s on Sunday 10 August. There is a fascinating, and little visited shrine quite unlike the conventional temples in Sri Lanka, within easy reach of Kandy off the Pilimatalawa Road. 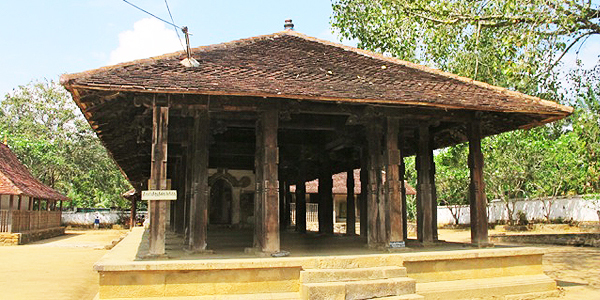 Built during the reign (1357-1374) of King Vikramabahu III, this consists of three open-sided pavilions, the main one being the Hall of Drummers. The attraction is the way this has been constructed with an intricate ceiling of interlocked wooden beams and 40 columns of gammalu wood (a hardwood peculiar to the Indian subcontinent). 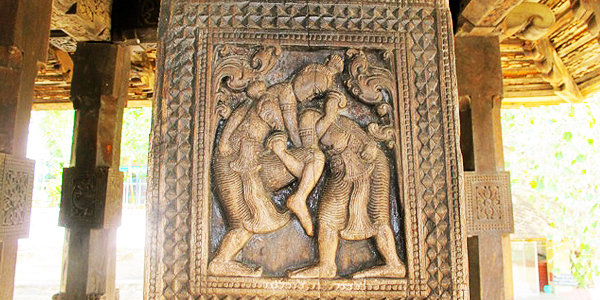 The elaborately carved wooden panels depict scenes of village life, including one of traditional Angampora wrestlers. 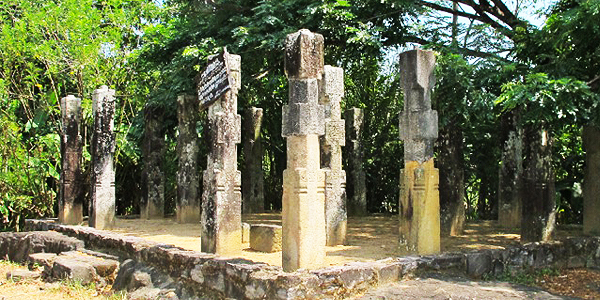 An even older relic can be seen close by where carved stone columns are all that remain of the Embekke ambalama (shelter) built during the reign (1341-1357) of King Bhuwanekabahu IV. The many shops selling brass items on the road to Embekke reflect the traditional occupation of village craftsmen, which is creating brass and silverware. Kandy is on the main railway line to Hatton, Nanu Oya (for the hill country resort of Nuwara Eliya), Pattipola (the closest station to the summit of the track at 6,266 feet above sea level) Ella (for journeying to Arugam Bay), and the terminus of Badulla. 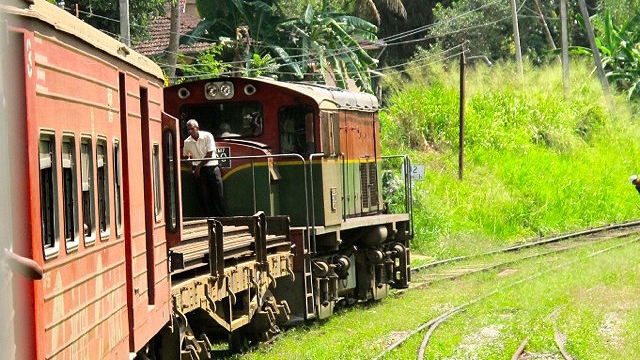 Kandy also has a rarely used (by tourists that is) branch line to Matale. Matale is 25km north of Kandy, and a visit there makes for a leisurely day seeing the interior of Sri Lanka. The journey by train is like a ride back in time. 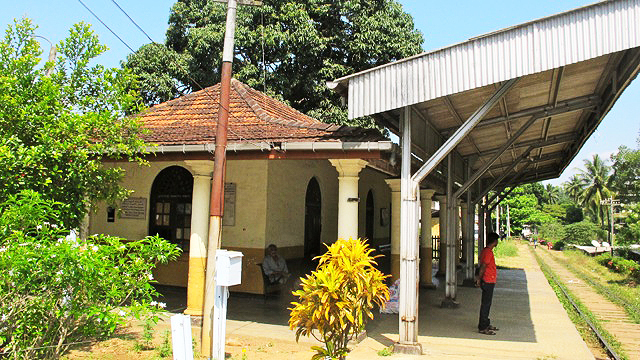 The first station on leaving Kandy is Mahaiyawa where the original bungalow-style station building, built in 1880, has a colonnaded veranda, now obscured by a modern metal-roof platform shelter. 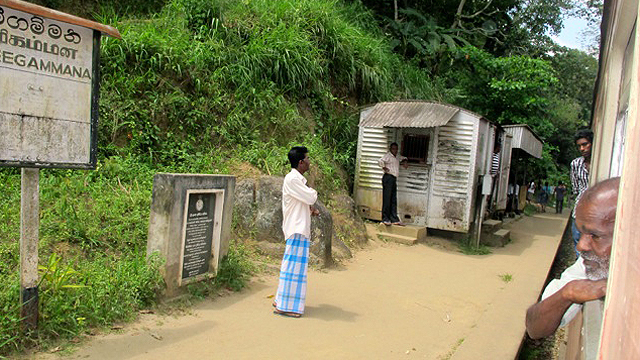 Some stations on this broad gauge railway track are no more than halts, with a ticket office converted out of an old guard’s van, such as at Meegammana. Since this is a rural line in the classic tradition, with landscapes of terraced paddy fields by long bends and richly wooded hillsides, no one expects the train to hurry, and it doesn’t. Being a single track the train has to halt in a siding when a train is coming from the opposite direction. The carriages are hauled by a Class M7 diesel electric locomotive, one of 16 imported from the UK in 1981. The train leaving Kandy at 1015 gets to Matale at 1140, giving an opportunity to explore the town and have lunch in one of its many pastry shops, with a train leaving Matale at 1355 arriving Kandy at 1525. The one-way fare is Rs25 (about 12 pence). I have just learned that my neighbours, who chortle loudly every morning as they leap around looking for breakfast, are listed among the 25 most endangered primates in the world. I am referring to the troop of purple-faced langur monkeys who regularly perform acrobatics in the trees of my garden and the adjoining woodland. 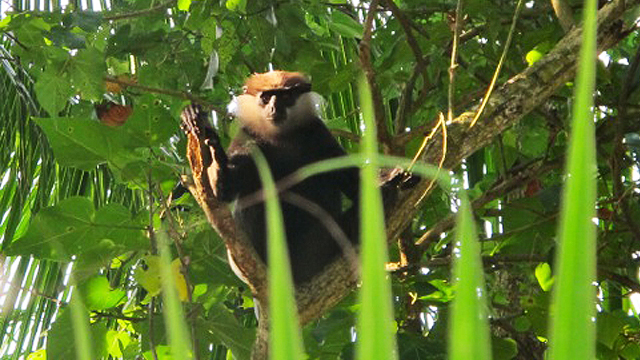 Known as Kalu Wandura in Sinhala (the scientific name is Semnopithecus vetulus) these monkeys, endemic to Sri Lanka, are found nowhere else in the world. The International Union for Conservation of Nature (IUCN) has declared that the species is in serious jeopardy. This is because the Kalu Wandura depends entirely on trees for survival, not just as its home and means of travelling around its territory, but also for food since it exists on leaves, as well as flowers, fruits and other plant parts. As development spreads and nature’s jungles are demolished to create concrete ones, the Kalu Wandura loses both its home and its food source. The monkeys who are my neighbours are a jolly crowd. Their day begins with an early morning chorus of loud calls given by the leader summoning his group to get up for breakfast. He gives these calls with breath-taking leaps and jumps among the trees triggering a chain reaction among the others until it seems to be raining langurs. 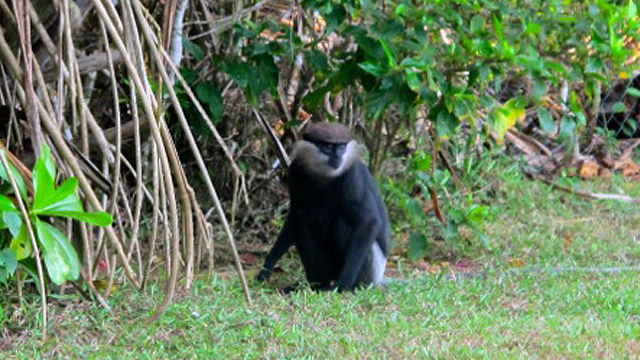 After the early morning burst of acrobatics and feeding, the monkeys rest or gambol on safe patches of ground, like my lawn. Unfortunately, my human neighbours don’t like the langurs much (since they eat their bananas and mangoes) and try scaring them off with firecrackers. But the tribe of Kalu Wanduras wandering around this part of Sri Lanka seem a resilient bunch. I hope they survive. I agree – Kandy is a perfect central place for any tours – all the different aspects of life and environment in Kandy are all there. I worked there in 1997, and managed to see the Perehera as well as trips to the tea estates, mountains and many of the “Golden Triangle” highlights.